My hair is one of the best assets that I have. I have kept it long for years because I'm afraid to cut it short since based on experience sporting short hair was never going to be flattering to my round face. I have tried to have it in layers, did have a full or side bangs every now and then; but that is about it. But as for hair dyeing and all other sorts of chemical and heat treatments, name it I have done it! I’ve gone from black to brown to ash. I had Brazilian blow-outs and rebonding several times too. That's why I am glad my hair hasn't given up on me just yet. I must say though that since it is one of my pride and glory, I always make it a point to take the best care for it. I've been in the area of tip-toe-ing whether to keep my current hair color though. Sporting an ash blonde hair takes a lot of effort, since it is easier to notice if there's damage there or all these baby hairs springing through my head. I'm thinking of dyeing it in a darker shade. Not like jet black like Cleopatra because it'll be hard for me to dye it in a lighter shade in the future. Good thing there are available options for me to try, like using hair extensions using Brazilian hair that I can use to check if a darker shade would suit me. I would also love if my hair would have some more volume like the model's hair above. I can't do anything about volumizing my hair because it is already what is. I've tried volumizing products before but to no avail. So probably the only best option is to go for hair bundle with closure instead (like the one pictured below). 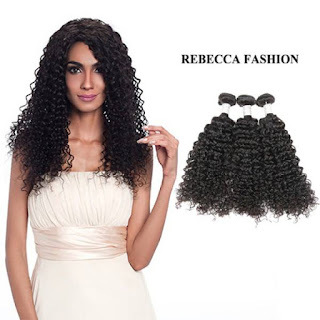 I've checked out this site that sells wigs and clip in hair extensions, named rebeccafashion and they have an extensive array of products that I can try for my hair problems or if I want to get pretty experimental with my hair and forget about damaging it even more. They are pretty much one of the best place for if you're looking for hair extensions and the like.